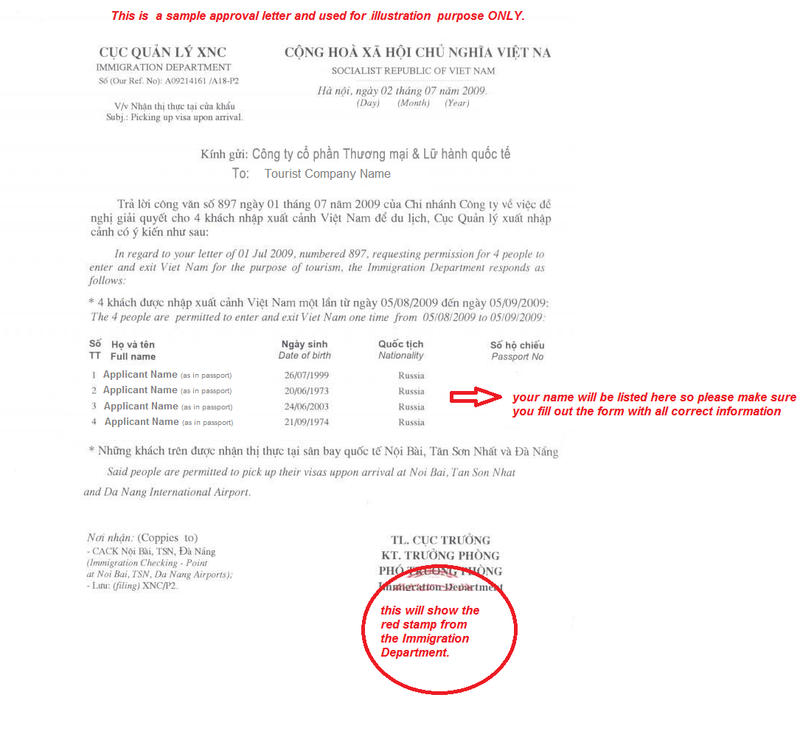 The "Vietnam Visa approval letter" is a letter issued by Vietnam Immigration Department (Vietnam Ministry of Public Security) that allows you to enter and exit Vietnam for a given time period. With the approval letter, you can pick up your visa upon arrival at one of the three international airports in Vietnam (Hanoi, Ho Chi Minh City and Da Nang). Note: Vietnam visa approval letter is usually issued in group and therefore, you may find your name, passport number and date of birth in the same letter as other people. You can either apply yourself by submitting the form to the Vietnamese embassy/consulate in your country or apply Vietnam visa on arrival with us. Click here to get visa on arrival (for those traveling by air and picking up visa at airport). Normally, after you finished your visa application and made your payment, you will get your visa approval letter via email within 2 working-days (standard service) and 2 to 4 working-hours (urgent service or rush service). 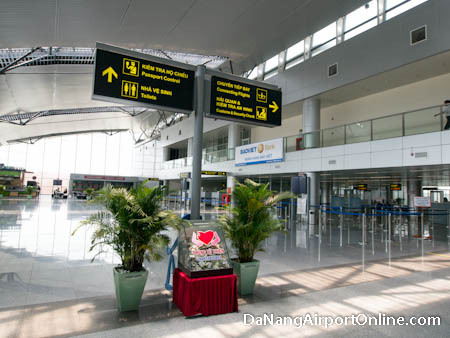 Note: the visa counter at Vietnam airport is 24/7 open so if you already have the approval letter, you can still pick up your visa at Vietnam airport on weekend. - "Pending" status: Your application has finished, however your payment has not yet completed. Secon: Please pay by credit card or Paypal when you submit apply online. After receiving your rush visa request, we will contact with the Vietnam Immigration Department for your case, and inform you within 30 minutes about exactly when you will get your visa approval letter. You would get it within only 2 hours to 1 working-day from this via email. Note: Rush visa/Urgent service is only applied for Vietnam visa on arrival, and will be stamped at Vietnam international airports (Noi Bai, Tan Son Nhat or Da Nang Airport). - Print your Vietnam visa approval letter together with entry & exit form (fill in it before getting to Vietnam). - Take visa approval letter, passport, 2 passport-sized photos, entry and exit form, and stamping fee with you to show at Vietnam airports. - Queue and show your documents at arrival counter. You can expect the process to take about 15 minutes total and get your visa. It depends on how many people are arriving at the same time as you and who also need a visa on arrival. The wait time hardly exceeds 30 minutes and is usually around 10 minutes. Make sure you have all required documents ready to avoid delay. 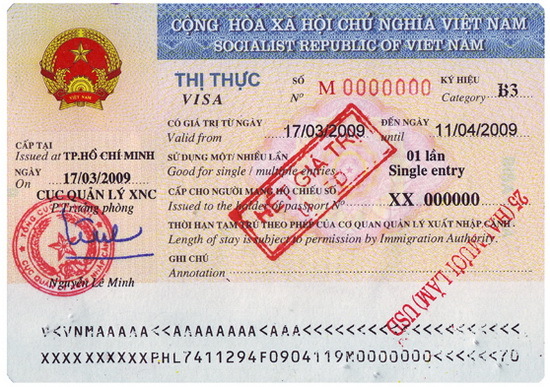 Vietnam Visa at Embassy means "Visa Approval Code". The code to be given to Vietnam visa applicants for them to base on it to get the Vietnam visa stamped onto their passport at the Vietnam Embassy/Consulate in their country. This means those applicants will get their visa before traveling to Vietnam. It is not to get Visa upon arrival. No! This type of visa is applicable to air travel only. Three (03) international airports in Vietnam that you can get your stamp with this approval letter are: Noi Bai International Airport (Hanoi), Tan Son Nhat International Airport (Ho Chi Minh City) and Danang Airport (Danang). If you want to entering Vietnam by land, please use our Vietnam Visa at embassy service. To apply for a visa to Vietnam, your passport must be valid for at least 6 months. Therefore, please extend your passport or get a new one before applying for your visa. For example: If you apply for a 1-month visa and submit your arrival date as Jan 1, 2014, the visa letter will be valid from Jan 1, 2014 to Feb 1, 2014. You can arrive anytime between Jan 1 - Feb 1 but must leave the country by Feb 1, 2014. Note: The approval letter can not be amended once it is issued, so in case you wish to arrive earlier than the date stated on the approval letter. You are required to apply for a new letter of approval to update the date of arrival. A Vietnam visa application can be applied for 1 day to 6 months in advance. Although it takes only 2-3 working days to get your visa approved, it is strongly advised that you apply for a visa to Vietnam from 1 - 2 weeks before your arrival date to avoid urgent fee or any unwanted problems. Service fee (shall be paid in advance) + Stamping fee (pay in cash at Vietnam Immigration Officer at airports). For detail information, please read our Vietnam visa fee. 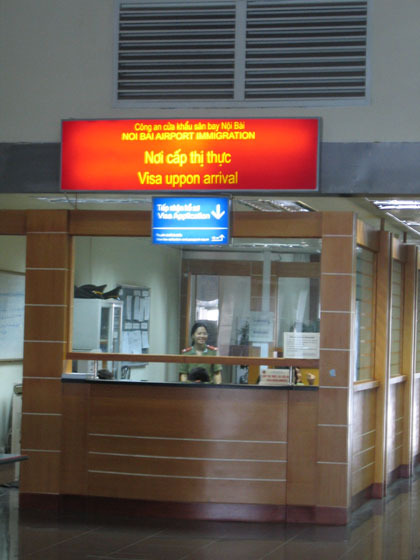 Visa Service fee is the fee paid online to us before traveling with a view to getting your Visa Approval Letter issued by the Vietnam Immigration Department. 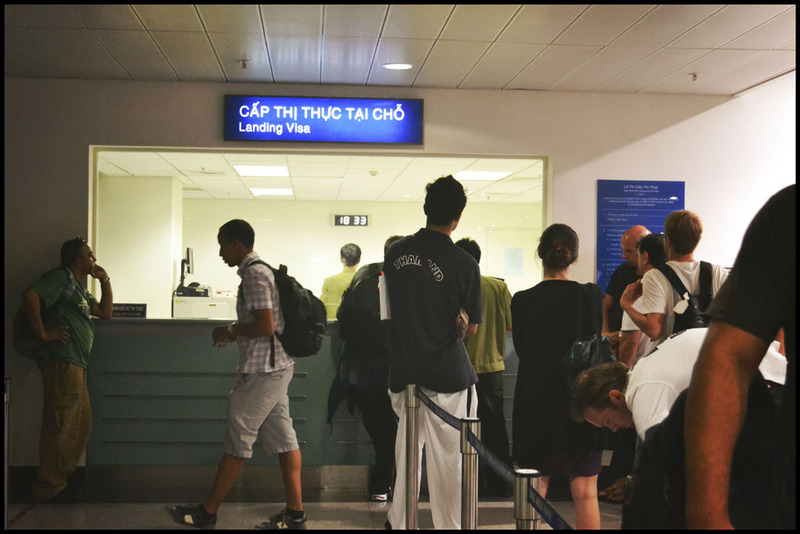 The prerequisite is that our company guarantees for you at the Vietnam Immigration Department. Visa stamping fee is the fee that must be paid directly to the Immigration Officer at your arrival airport or at embassy/consulate (for Visa at embassy). The stamping fee must be in cash, no credit cards are accepted. You can pay for the approval letter after you submit your application. If you have problems with payment, email us at sales@getvietnamvisa.com and we will send you a link or instruction to follow in order to pay. Keep in mind that no application can be processed until the full payment is made. Visa on arrival works if you arrive at any of the three international airports: Tan Son Nhat (in Ho Chi Minh City), Noi Bai (in Hanoi) and Da Nang (in Da Nang). There is no problem with switching between these three airports. No, you can not. In order to board the plane, you must show the approval letter to the airlines. This letter is also compulsory in order for you to get the visa at the Vietnam airport. Therefore, we recommend that you leave plenty of time to apply for the visa to avoid having to delay or change your flight. No, you can not. You need to enter on exact or later date of arrival granted in your visa approval letter. Your nationality shown in your passport. - For single entry visa: You can enter and exit Vietnam 01 time. If you would like to re-enter you need to apply for multiple entry visa. - For multiple entry visa: You can enter and exit Vietnam more than 01 time as you want during your visa validity. We currently accept both Debit/Credit cards (Visa, Master, Amex, JCB, Union Pay, EuroCard, Diners Club ), PayPal, Western Union and Bank Transfer for our online approval letter service. We use Secure Socket Layer (SSL) technology to encrypt all information. To check our site's authenticity and to verify the validity of our secured communication and information exchange lines, please click on the lock at the address bar of your web browser. Your credit card will be charged by TUN TRAVEL VIETNAM, the company managing all credit card transactions including GetVietnamVisa.com. If you have any questions regarding charges to your credit card, please contact our TUNG NGOC TRAVEL Support Center. - Vietnamese overseas (Viet kieu) are offered Vietnam visa exemption to enter Vietnam. Please directly contact the Vietnam Embassy / Consulate in your area for "visa exemption letter". Please click here for more details http://mienthithucvk.mofa.gov.vn. - If you would like to avoid hassle when chasing down embassy, and save your time, please apply for Vietnam visa online with us. You can also email us at sales@getvietnamvisa.com and one of our Customer Support members will reply within 2 hours during working-day and within 24 hours outside of office hours. Notes: Though our working hours are from 8.00 to 17.30, the website service is available 24/7 and is systematically automated. Therefore, you can still apply for a visa even when it is midnight in Vietnam. 1. Please send us the scan of your passport and the page containing your current Vietnam visa to our email sales@getvietnamvisa.com then we will process it with Vietnam Immigration Department to check your information before extending/renewing your visa.